I've just been watching the Doctor Who season 6 opener, The Impossible Astronaut. I thought it was utterly fantastic and highly disturbing. When I said in my last Doctor Who related post that I thought the trailer was hinting at an epic series... I realise I wasn't understating. Kudos to Steven Moffatt for taking a gutsy move and apparently killing the Doctor forever, in the very first episode of the new series. It's got people scratching their heads, reeling in shock... scribbling down theories... and reacting strongly (with some seeing it as a tool to curtail the show and limiting it to a certain length in terms of episodes). Is the Doctor's number finally up? I don't think that's the case at all... and if you do, I humbly suggest you've probably bought into a deliberate red herring and swallowed it whole. If there is one thing Moffatt has a tremendous talent for, it's ratcheting up tension and suspense... and this I believe lies at the heart of what's going on. How do you add peril to a character who is seemingly unkillable (at least for another couple of generations), well it's simple... you kill them (in The Doctor's case by completely bypassing the "get out clause"! That way you have this shadow hanging over the character for at least the next episode and/or possibly the whole series. A master stroke. One warning here - don't expect Moffatt to simply retcon the death away... he's not RTD. Yes he may use timey wimey stuff to explain the situation but he won't flip a switch and deus ex machina his way out of the situation. I think the likelihood is that as the episodes/series go on, we will gain more and more insight into what was really going on in that seemingly final exchange... that will give us a new perspective and the proper resolution. I thought the Silence were utterly creepifying. The exaggerated head size and skull like facial features (sans mouth) made them look incredibly disturbing. 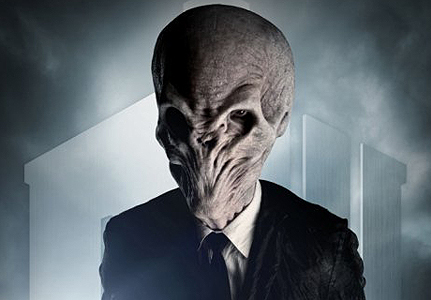 Moffat has a penchant for plugging into our basest primordial fears and concerns in everyday life... and used this as inspiration for the Silence - how scary is an enemy that you can't remember even seeing? The VERY sinister and creepy Silence. The drama and suspense were neatly balanced with some top draw humour. The Doctor cropping up in history and drawing attention to himself in Enlightenment era art, a World War II prisoner escape tunnel and a Laurel & Hardy movie (complete with Fez), was good way to start the episode before taking a dark turn. The interaction between the Doctor and River was as usual flirty and charming... with the odd dash of cynicism on the Doctor's part. Calling her Mrs. Robinson was just brilliant though. Next week can't come soon enough for me - Whomania is back... it is in full flow and it's going global. I thought the episode was very appropriate for Easter Saturday. 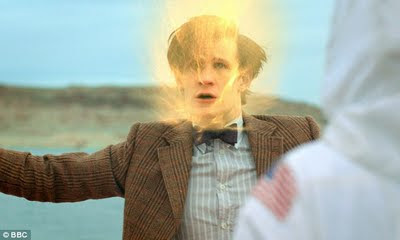 Firstly it reinforced what I was saying about Jesus and Brother Edward on Thursday... because the Doctor in this episode also finds himself in a situation where he knows his end is coming (he clearly knew who was in the astronaut suit and he knew exactly what was coming), yet the Doctor remained and accepted the fate put before him. You also had River, Amy & Rory grieving and forlorn after the Doctor's demise, not knowing which way to turn or what the best thing. This made me think very much about how Jesus' companions must have felt, following Good Friday. If that wasn't enough you have the absolutely stunned reaction as the fourth invited party walks into the diner. 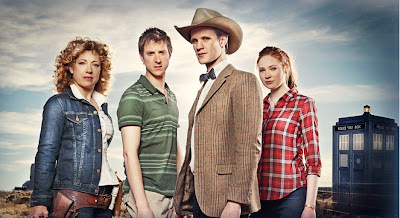 Having just burned the Doctor's corpse... the mishmash of intense and varied emotions that hit Amy, Rory and River as they saw the Doctor walk through the door... perfectly mirrored the kind of expressions you might have expected from the apostles on Easter Sunday. So as I said, all in all a great episode and a perfect one given the season. I cannot finish this post without thanking the BBC for the wonderful, heartwarming and reminiscent tribute to Elisabeth Sladen (entitled: My Sarah Jane), that was screened on CBBC immediately after the episode... as well as the screen caption. I know some people will be wondering why the Nicholas Courtney (who playing the equally beloved Brigadier), didn't get a screen caption. I believe he will get one... the Beeb probably want to pay tribute to them respectfully as individuals and not cram them together like sardines. I also think Sarah-Jane's character is a very special one because more than any other companion or side character... she binds the classic and new series together. If you look at the tribute pages for Elisabeth Sladen you will see that she is appreciated by fans, new and old... right across the spectrum... that in itself pays tribute to the kind of sincerity and emotion Sladen brought to the role... and perhaps the biggest reason she will be deeply an sadly missed... but remembered and treasured with even greater fondness and respect.